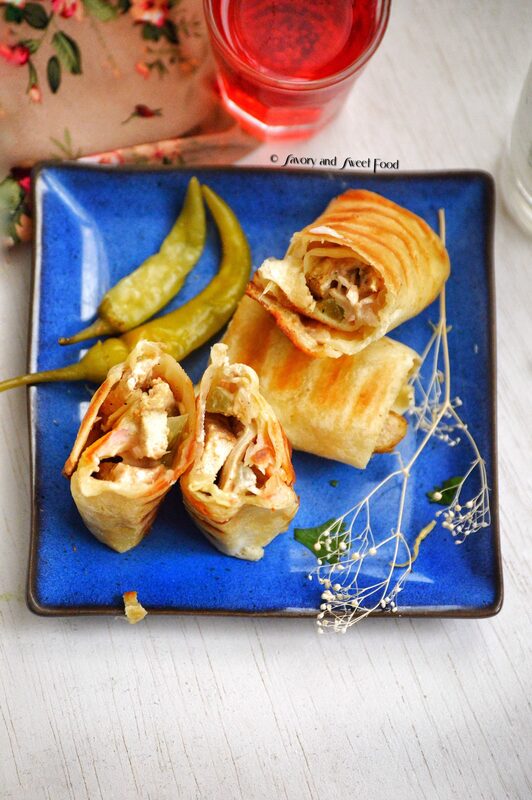 Homemade chicken shawarma wrapped inside tortillas. This is so good that it will be a crowd pleaser even among the fussiest of eaters. 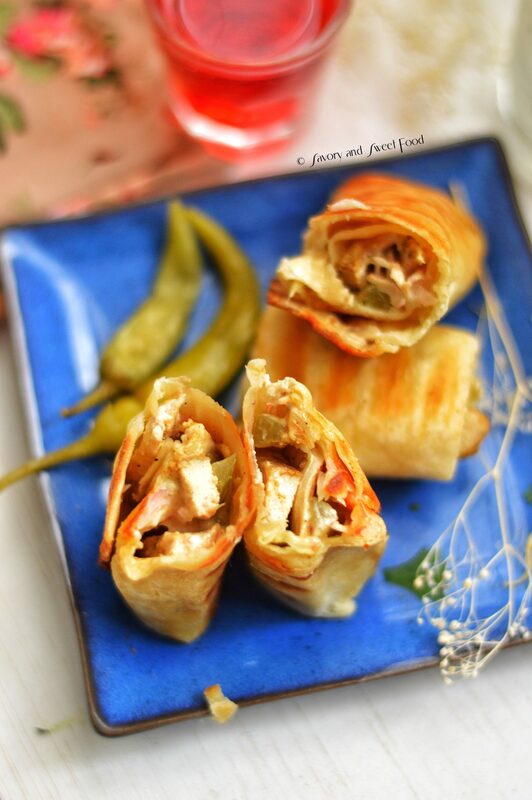 Chicken Shawarma needs no introduction. It is popular all around the world now and also all around the blogosphere. 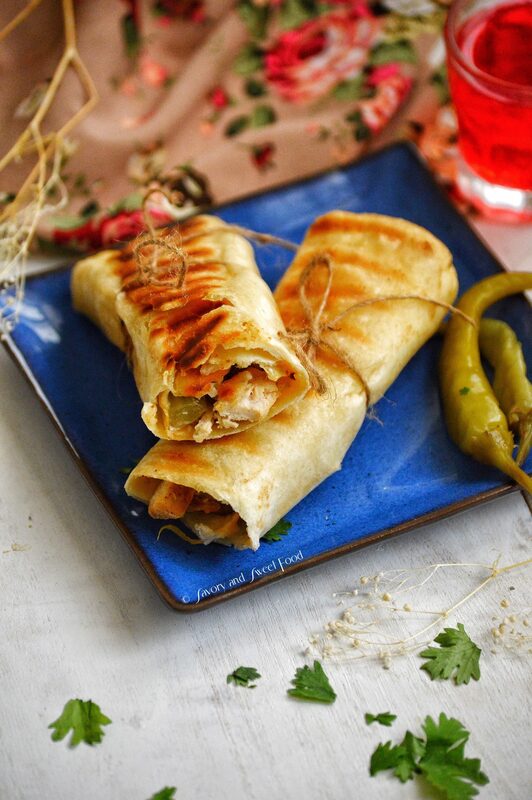 There will be thousands of Shawarma recipes out there and I’m sure each of them are equally good because it is very difficult to mess up a shawarma….unless you burn the chicken or something. This chicken shawarma recipe is bursting with the Middle Eastern flavors. I had made this few weeks back and I couldn’t wait to share it with you guys. 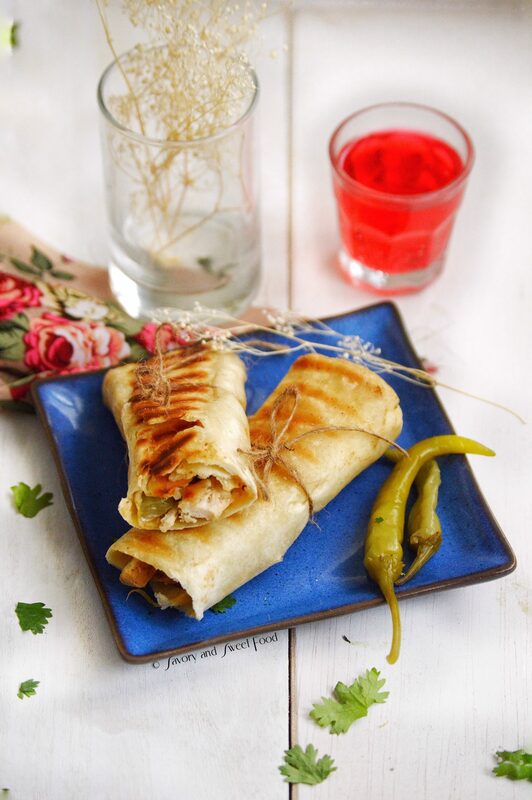 All thanks to my best friend (Nimeena, whom I am sure most you know by now) for this best chicken shawarma recipe. Nope! I am not exaggerating, this really is the best shawarma I made so far. Nimeena always shares the perfect recipes with me. There are many other recipes which she contributed in the blog. Just search Nimeena in the search bar and you can find all of those posts. It all one better than the other, I swear. There are two sauces in this wrap, one with yoghurt and tahini and the other one is a chilli mayonnaise sauce. This is not the authentic shawarma recipe first of all, obviously because I shallow fried my chicken in a pan, whereas it is usually prepared on a spit and it can be grilled for as long as a day. Well, no one will have a spit in their house, and since we can’t spare a day to make shawarma, this is a speedy, easy method. And in this recipe, garlic sauce or toum sauce is not used, instead garlic is added to the mayonnaise. You can add it to the yoghurt mix too. 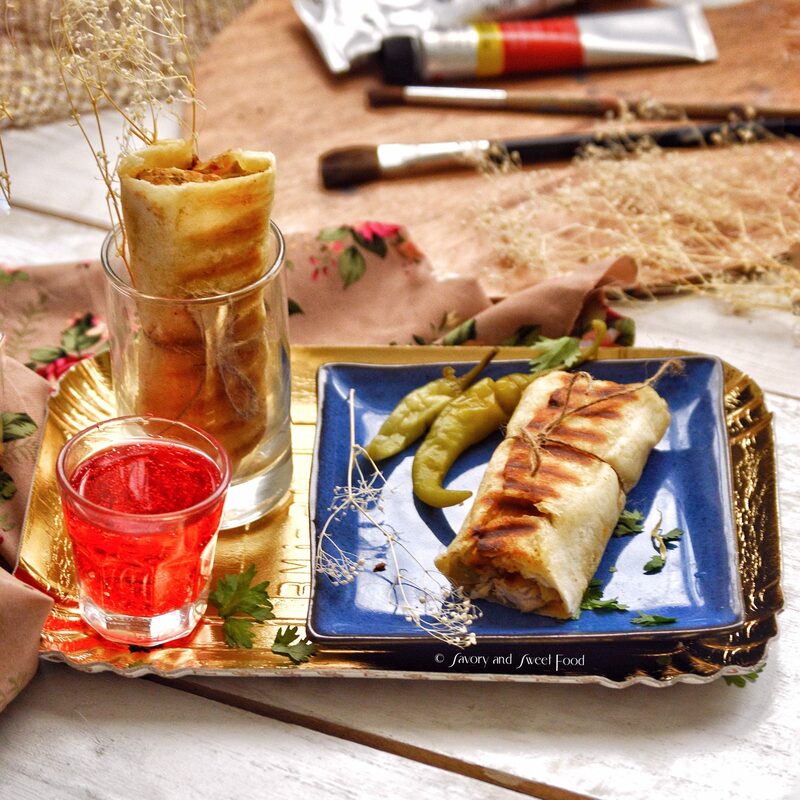 The beautifully Arabic spiced chicken along with the sauces and the pickled relishes, and other fixings inside a toasted tortilla is to die for. Please do try them out. I toasted the wrap in my griddle pan. It was a little messy and difficult to flip the wrap as the filling was coming out. If you have a panini press, then it would be best to toast the tortillas in that. 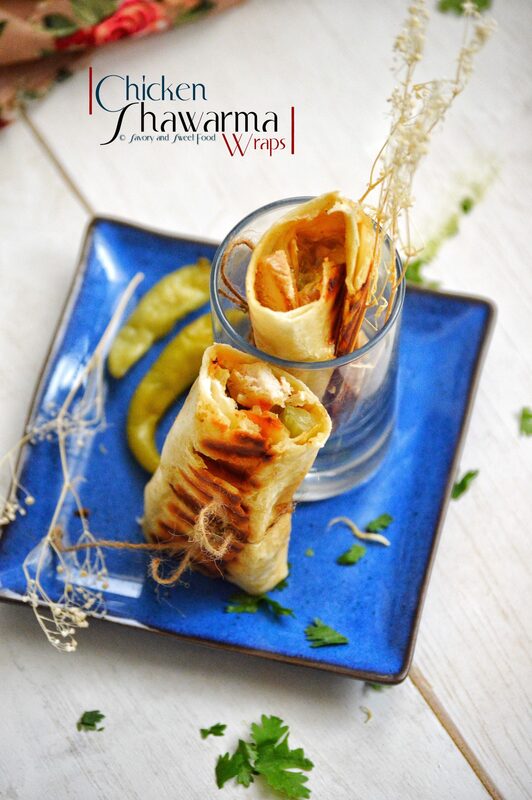 You can have the shawarma wrap without toasting it too. 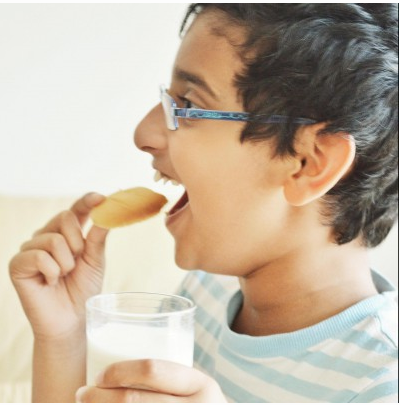 It will taste equally good. Marinate the chicken breast with the above mentioned ingredients. Let it sit for 2 hours. Heat olive oil in a pan and fry the chicken till cooked and charred on the outside. Place the lettuce on the tortilla. Then add chili mayo, chicken, pickled cucumber, tomatoes, french fries (all that you like to add). Finally drizzle yoghurt sauce all over. Close the wrap and toast with some butter till brown and crisp. 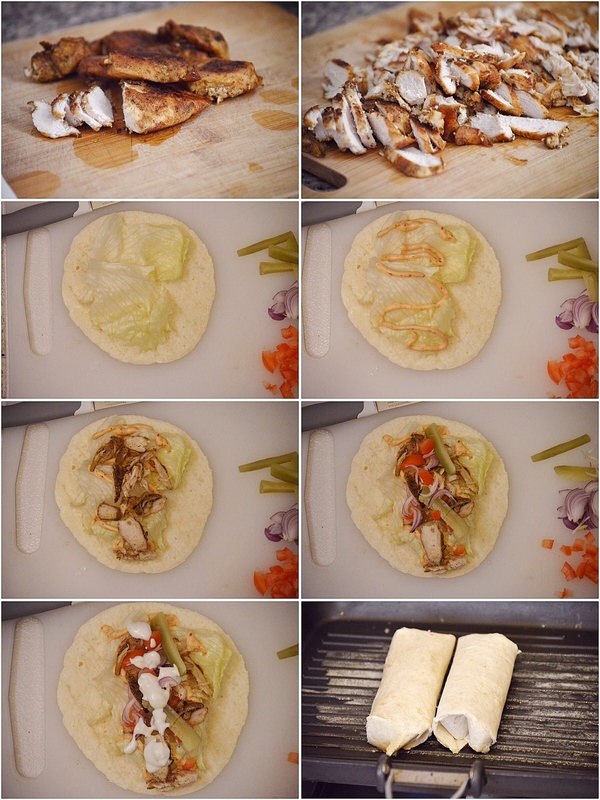 If you have a panini press, then toast the tortilla rolls in it. It would be less messier. After assembling, cover the roll in aluminum foil. Then place the roll with the aluminum foil in a frying pan. Cover it with a lid and cook on both the sides on low flame till nicely heated through. You can also toast the pita bread in a pan, but that might make the pita a little dry. But if you get nice quality, soft bread, then it will be fine to do so. You can toast the rolls in a panini press too. That would be perfect. Can’t wait to try !!! Looks delicious !! True you take even a simple recipe to an extra ordinary level….Great Work !!! Masha Allah !! Thank you so much. Thanks for letting me know about the tilt in the pictures. I was going through some of my old posts and I felt there is a tilt too. Now I take pictures from a different place and I think now there is less tilt. What do you think? These look delicious! All the pleasures of street food with a homecooked touch. So perfect for lunch or even for an afternoon snack!